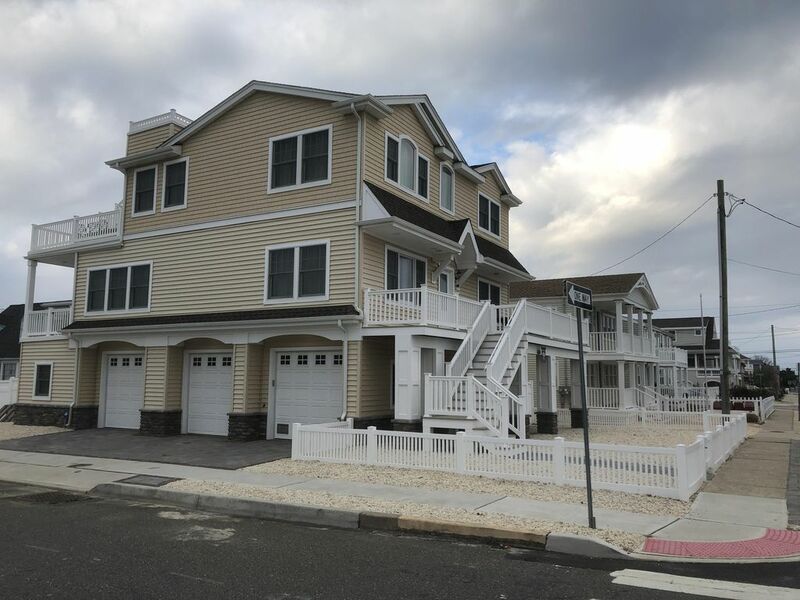 New construction in 2015 and FANTASTIC LOCATION in Beach Haven!!!! My name is Aaron Lee Heimowitz, and I strive to exceed your expectations of what a shore rental should be. Please read the costs carefully as the total is more than my rent and these extra fees are mandatory WHEN YOU BOOK DIRECT via VRBO. Please message Aaron Lee Heimowitz in Princeton NJ with ANY questions/concerns pertaining the NJ Tax or service fees. Located on the corner of 10th Street & Beach Ave this bright and airy TOP FLOOR duplex with its many windows and open floor plan is in one of the best vacation locations in Beach Haven. Conveniently located within a short walk to anything you could want: Beach or Bay, Shopping, Restaurants and Nightlife, you never have to get in the car and drive for anything - this will be your easiest family vacation. Forget your car and walk or ride your bicycle for all of your needs. Beach Ave is a very safe 25 MPH one-way street with wide bicycle and jogging lanes. It is safe for kids and heavily patrolled by the always pleasant Beach Haven Police Department. This shore rental will be nicely furnished and well appointed. The Master Bedroom will have a King Size bed, Smart TV, and the private full bathroom will feature a large tiled stall shower with sliding glass doors. The Master bedroom also has a walk in closet and its own private access to the large 2nd floor deck and its expansive views. The second bedroom is appointed with a queen bed, dresser, two nightstands, and a large closet. The third bedroom will sleep three with a twin bunk and another twin bed and also has a nightstand, dresser, and a large closet. The kitchen features full Granite counters and Stainless Steel Appliances with dishwasher. There is a stacked washer/dryer adjacent in its own closet. The large rear deck opens off the dining area and also from the master bedroom. This private deck has expansive views of the Barnegat Bay, Shelter Harbor Marina, Bay Village Shopping, Fantasy Island Amusement Park, and Thundering Surf Water slides, all two or three blocks away. This deck will feature a large table with umbrella, and seating for eight with plenty of room for more guests. A hard lined gas grill is provided for your outdoor cooking at the GROUND level. The furnished large Rooftop Deck provides fantastic panoramic views of the Atlantic Ocean, Beach Haven, the Barnegat Bay, and Atlantic City and the Barnegat Inlet Lighthouse. Enjoy a peaceful cup of coffee up top while the family sleeps in! This Shore Rental has had no expense spared. Smart LED Televisions with Dish Network Satellite are provided in both the family and master bedroom. Everything is the way you would expect a vacation rental should be. While the rental has central air conditioning there are lots of windows to take advantage of the strong onshore breezes. Leave the windows open and take advantage of this wind which typically comes out of the southeast. Ceiling fans are in all the bedrooms and family room. Park your car for the week, everything you could want is in walking distance, restaurants, amusements, water park, nightclubs, theaters, and shopping. Beach Badges are furnished for all guests >12. We strive to maintain an enjoyable, clean, safe, family friendly environment for our guests and their families and friends. Book EARLY - many of our guests are repeaters because of the property location, and our obvious desire to see you have a great time during your stay. Property has been 100% rented each season so please reserve early. Peak-Season rents are strictly Saturday to Saturday, 3:00 check-in and 10:00 Check-out. Please do not ask for exceptions during peak season as I cannot disturb adjacent vacation weeks. If you want to arrive early and go to the beach I do welcome incoming renters earlier on Saturday morning and will provide the INCLUDED beach badges before your check-in. Beat the traffic and grab some time on the beach! If you have perishables we can temporarily stow them in the garage refrigerator until the cleaning crew comes through. OFF-PEAK SPECIALS AVAILABLE!!!! May & June and September & October are the best times to be on LBI because there are no crowds. Post season is the absolute best with warm ocean water and cool nights. Special requests are welcomed. Hop Sauce Festival immediately after Memorial Day Weekend is a very popular getaway. Over 20 local breweries showing off their prized crafts. Food and music! Please note: My home is NOT available for high school, college student, post-prom, graduation, wedding, bachelor or bachelorette parties. Please DO NOT ask. If you attempt to check in and there are no persons 21 years of age or older you will be asked to leave with security deposit forfeited. I stay downstairs with my family and absolutely want everyone to have a great time but do draw the line if I suspect it is going to turn into a the type of event that is offensive to families that live nearby. When a date is reserved an initial deposit is required within 48 hours to secure your week. .
Online calendar availability dates will be confirmed via email. I look forward to hearing from you about my rental, please don’t be daunted by my hardline stance about “partiers” above. Many of my vacationers have guests stop by and enjoy themselves until late at night, I’m perfectly fine with that and sincerely believe that this is YOUR vacation. I want it to be as enjoyable and stress free as possible. I just cannot risk an irresponsible tenant damaging the property creating issues for future vacationers. Both myself Aaron Lee Heimowitz and my wife Denise and our two teen daughters live downstairs for the summer and strive to provide our upstairs guests a guaranteed trouble-free stay. We encourage you to enjoy our home as if it were yours. if you want to have guests stop by to enjoy the view and outdoor breezes, please feel free. With having rented to over 200 parties since 2005 with all very positive reviews If you would like babysitting services while you are here please let me know. Both Daughters are certified in sitting and have taken multiple lifesaving courses. Beach Haven is the perfect family vacation destination. The Beaches are very clean and well guarded. There are amusements for kids a very short walk away and should you have a day with less-than perfect weather there are many things to do - just ask us for suggestions as we know what it is like to keep kids happy on a rainy day. Please do ask us for suggestions of restaurants, or anything else you think you may need. There are a ton of kids in this neighborhood and all the parents are engaged in their kids well-being. if you have kids that want to meet others, they will have a great time. If you want to rent bicycles and bicycle trailers for younger kids while here, there are plenty of nearby places to do so please ask me for suggestions of vendors. Beach Badges are provided with the rental. My wife and I and our daughters stay downstairs for the summer and will ensure anything that is amiss will be corrected quickly. Indoor dining seats 8. Outdoor deck seats 8. Great location! The house is very clean and spacious. This is our second summer at this rental. The location is perfect - close to all the attractions and beach. Aaron’s very easy to communicate with and has great recommendations for the area. We’ll be back! New, clean and well maintained. Great location and owners are very friendly. Really enjoyed our stay. The location is amazing with great proximity to the beach and bay village/fantasy island. The roof top deck and out door space was incredible between the deck and patio areas. Inside was very clean, new and well appointed. Felt like I was in my own home. The owners were onsite and very friendly and informative. Couldn’t have asked for a better shore stay. It’s all about location! You can walk and bike everywhere. This house is perfectly situated. Open the windows and catch the beach breeze! Go up to the deck and catch a beautiful sunset! It’s very welcoming with a crisp, clean beach decor and well designed accommodations. We had a great week! This is such a wonderful place to stay in Beach Haven. So bright, clean and updated! This was one of your favorite weeks ever in Beach Haven. Aaron and his family have created a wonderful spot for a beach getaway! The house is perfect. Open, updated, so clean with great views. We have already begun to look at the calendar to plan for our stay next year here! This property location is the best on the island - perfectly situated to walk everywhere in town. Located at the north side within Beach Haven, at the corner of 10th St and Beach Avenue this well appointed, spacious upper unit may be your best summer vacation ever. At the opposite end of the block from Beach Avenue you can find the 7/11 convenience store for those quick morning coffee runs or last minute grocery needs. Our rooftop deck is the perfect place to watch the sunset with friends. We are an easy walk to Restaurants, Fantasy Island Amusements, Thundering Surf Waterpark, Mini Golf, and Bay Village shopping. Walk or bike downtown to Engleside Ave where you can picnic at the family friendly FREE Wednesday Evening Concerts series at Bicentennial Park. Walk one block to the Bay and boat docks to watch beautiful sunsets while the fishing boats are coming back to port after a days catch. Many Toddler-Friendly playgrounds also nearby as well as very wide child-safe bicycle lanes on one-way Beach Ave and Atlantic. Situated on a narrow portion of the island both the Bay and Ocean are only two blocks away on either side providing fantastic views in every direction. All PEAK season rentals are Saturday to Saturday. Pre/Post season rates and dates are flexible. Please do ASK if you have a special request.